If you love potato chips, you will probably love baked crispy kale chips too. They are so simple to make, quick and nutritious, and you can’t stop eating them! 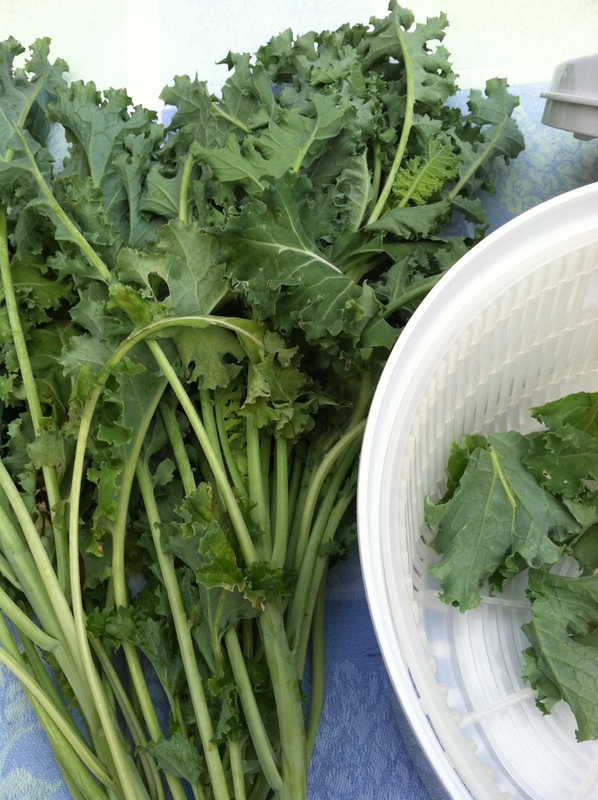 The shared bounty this week was baby kale. 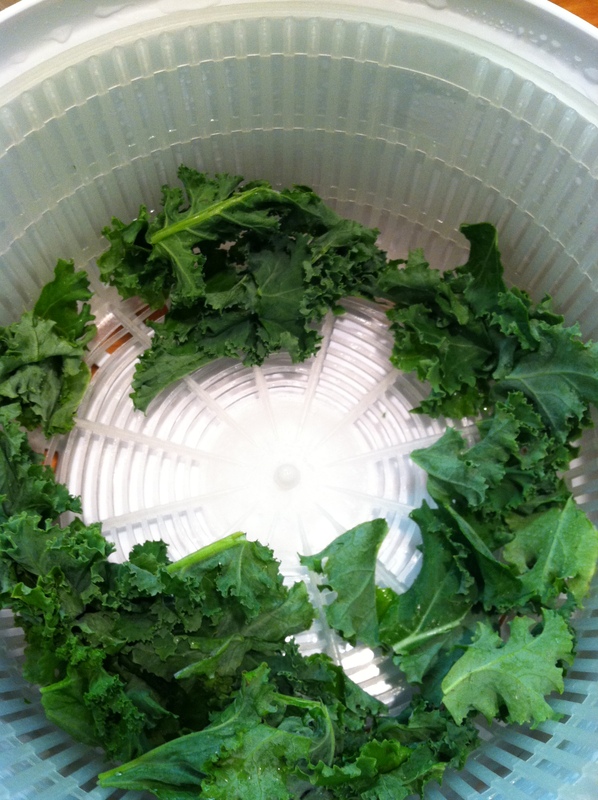 Here is how you make the baked crispy kale chips. Preheat the oven to 350 degrees F. Line a baking sheet pan with parchment. Do not use an insulated baking sheet pan. 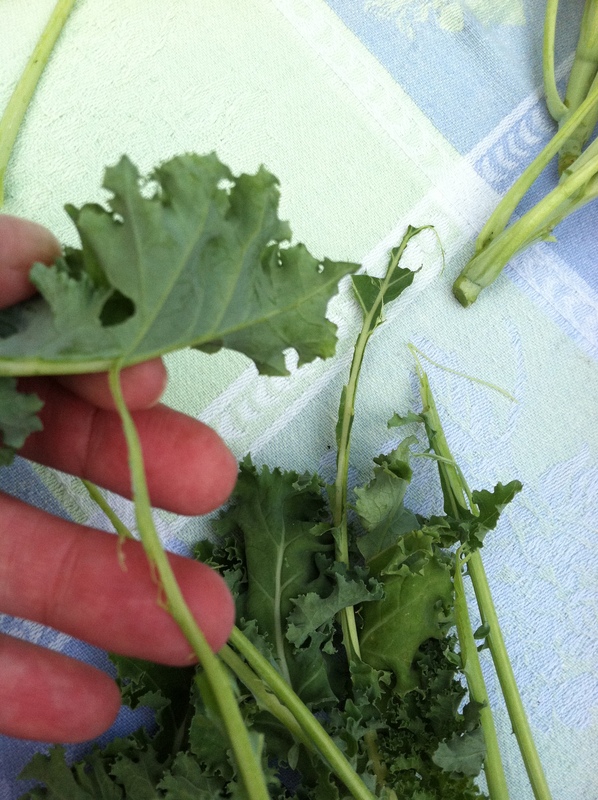 To make the chips, remove the leaves from the kale stems. Do this by holding the leaf and pulling the stem off from the back side of the leaf. This removes the stringy stem all the way down the leaf. Tear the leaves into bite size pieces, but not too small. Wash and spin dry in a salad spinner. 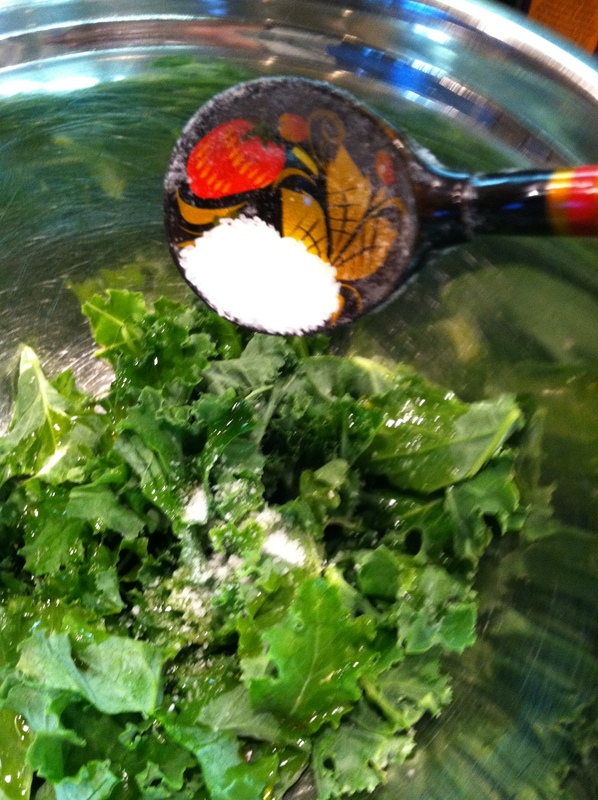 Place the kale in a bowl, season with a light drizzle of olive oil and a light sprinkle of salt. 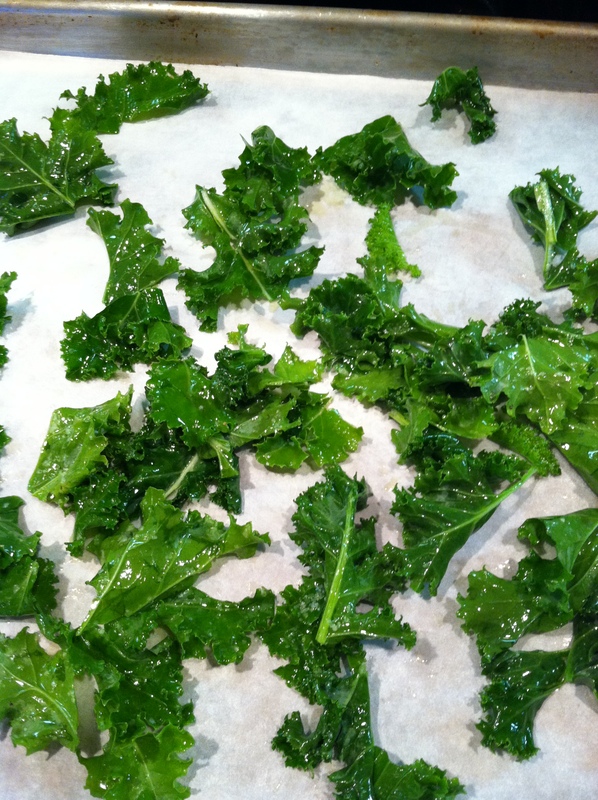 Spread the kale on the baking sheet and place in the pre-heated oven for 10-15 minutes. The younger and more tender the kale, the less time it takes to crisp. When the chips are crispy and slightly brown on the edges, remove from the oven and serve. If you live in a humid area, the chips may need re-crisping by simply placing them in a warm oven for a few minutes. They have a lovely earthy flavor that complements many dishes. The chips make a great snack and are something different to put out at your next party. When taking a chefs certification once, I used the kale chip to compliment a dish of Lobster and Israeli Couscous with Grapefruit Emulsion. It was the perfect compliment as it brought warm earthy “umami” flavors which really made the dish pop. 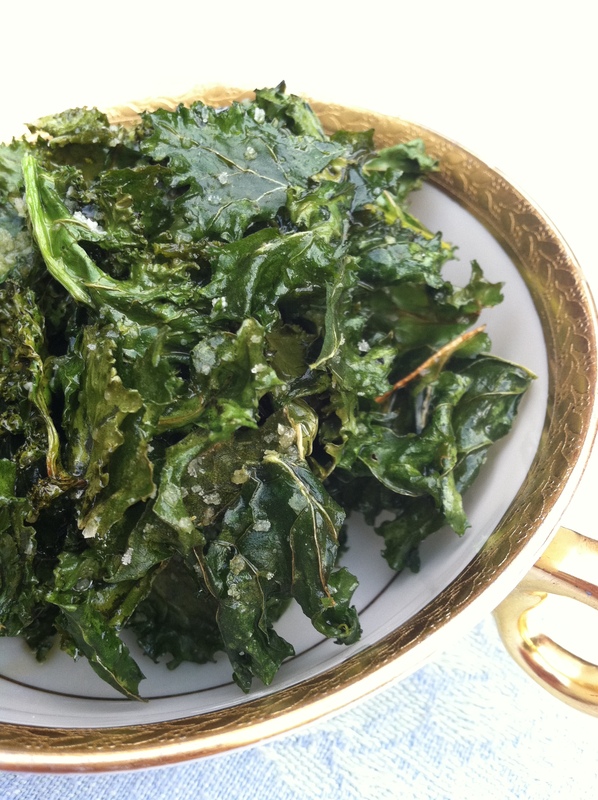 This entry was posted in Recipes and tagged baked kale chips, Baking, food, Kale, Kale chips, nutritious snacks, Olive oil, Oven, Potato chip, salt, Sheet pan, vegetarian. Bookmark the permalink. Oh yum! Can’t wait to try. I’m gonna check out the spicy recipe version next. Yes! Play with flavors and please share your favorites and what works and what didn’t. They are so quick to make and addictive. These are so easy and tasty. Just watch the salt, it is easy to over salt them, or use other seasonings! Thank You for the note about the salt. I am having company soon this would be a really fun thing to make for a sit around snack. They would think you are a genius. Let me know how they like them! I love this, thanks for sharing. I tried once to make kale chips and forgot about them so they burned. I need to try again! Thank you, they are so crisp and delicate. I hope you try them. 350F or 175 C is the oven temp. Perhaps the pics take some time loading, is anyone else having issues seeing the photos? 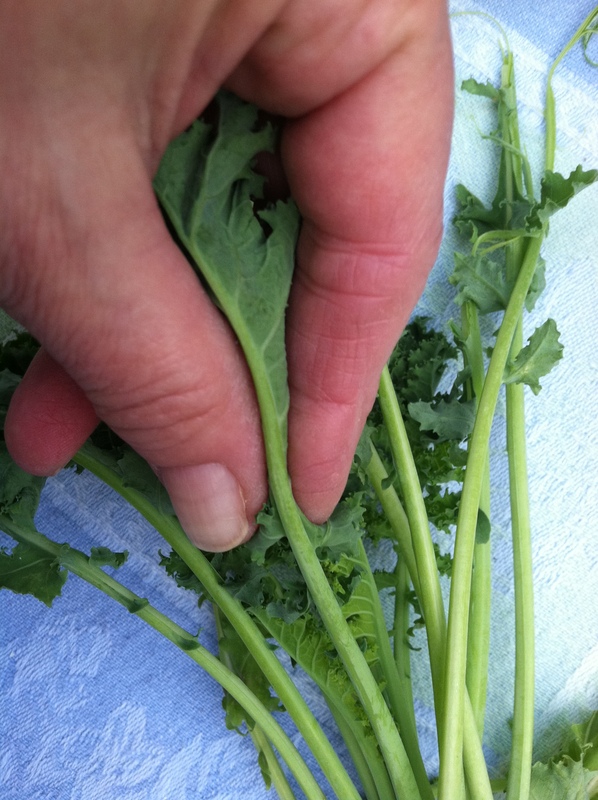 canu use baby kale to make the chips? Yes! It will crisp up quickly so you will need to watch it closely.